The group class schedules are generally drafted in May of each year and confirmed with the onset of the new academic year in September. Modifications are sometimes made in January as enrollment necessitates. Group Schedule for 2017-2018. For 2018-2019 we anticipate some classes will be in Worcester; some in West Boylston. 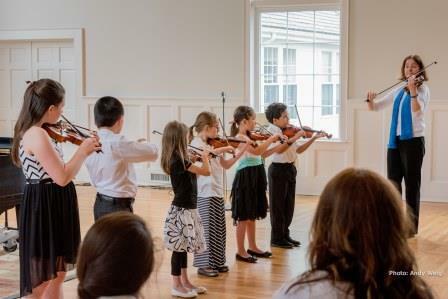 Suzuki Program students participate in a weekly group class in addition to private lessons. In group class, students learn to play together, review and reinforce skills learned in the private lesson and polish pieces for performance. Group classes provide support, motivation and fun to both students and parents and are as important as the private lesson in a student’s musical development. Students are placed according to their playing level, and not necessarily according to age. Class assignment is made by the Suzuki Coordinator in consultation with your private teacher. Your child will get the most out of the group class when it is held on a different day from the private lesson so please plan to come twice a week.